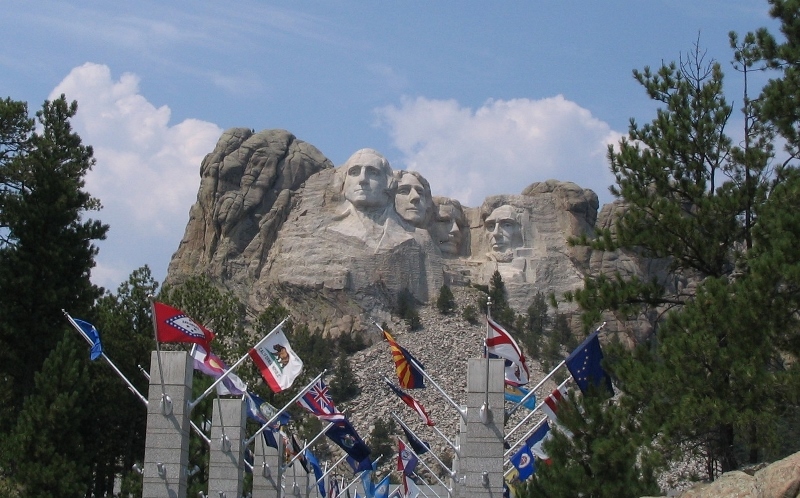 Heading out from the Mystery Mountain Resort in Rapid City, South Dakota, we set our sights on Mount Rushmore (link HERE). Alan and I had visited this National Memorial on our honeymoon - the trip we were now recreating with our kids who were ages 8 and 13 at the time. I can still remember standing in the viewing area all those years ago, a young adult mesmerized by the size and the scope of the sculpture. Since I was remembering it as we first saw it, I was surprised to see how much had changed at Mount Rushmore in the intervening years. Silly me. Time doesn’t stand still (more than 25 years had passed since our last visit!) and I know the National Park Service works hard not only to protect our precious treasures but, also, to improve the visitor experience whenever possible. According to the National Park Service web site, Mount Rushmore tells “the story of the birth, growth, development and preservation of this country” and it depicts this in a most memorable way. Alan and I don’t remember the Avenue of Flags from our first visit, despite the fact that the NPS site indicates that it was established in 1976. Perhaps it existed in a different form or perhaps the project had been approved but not yet built at the time of our honeymoon. In any event, I can assure you that we’ll remember it forever from this second visit. There are 56 flags lining the walkway, representing all 50 states in the union plus the District of Columbia, the Territories of Guam, American Samoa and the Virgin Islands and the Commonwealths of Puerto Rico and the Northern Mariana Islands. The walkway provides a red carpet, so to speak, that leads a visitor closer and closer to a most gorgeous view of the iconic Memorial. 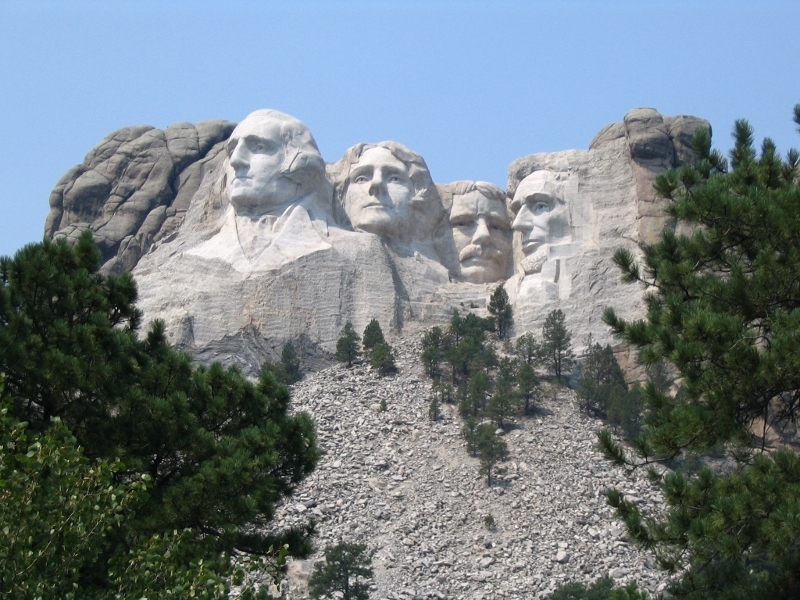 This rock sculpture of Presidents George Washington, Thomas Jefferson, Theodore Roosevelt and Abraham Lincoln is, quite simply, awe inspiring. Photos of the Memorial are readily recognized and quite impressive but having the opportunity to stand under this incredible sculpture is an amazing experience. We walked the Presidential Trail around Mount Rushmore catching views of the Presidents from many different angles. Were our kids impressed? You bet. And so were Alan and I - for the second time. I’m not sure that anyone can visit this Memorial and not be touched by it. I would like to think that our son and daughter will walk the Avenue of Flags with their own children in the future, tying yet another generation to our country’s history and the treasures that represent it. 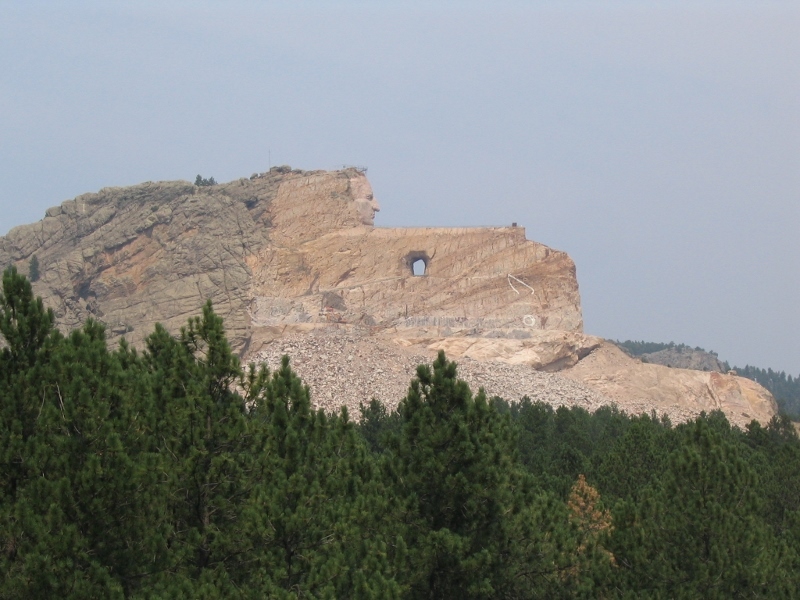 From Mount Rushmore, we moved on to visit the Crazy Horse Memorial (link HERE). The mission of the Crazy Horse Memorial Foundation “is to protect and preserve the culture, tradition and living heritage of the North American Indians” and the foundation is supporting continuing progress on the sculpture of Lakota leader Crazy Horse which was begun in 1948. This Memorial, too, was impressive, and represents another massive undertaking. The Memorial doesn’t accept government or state funding and is supported by admissions and contributions. So, if you visit, be prepared for entrance fees, tour fees and a more commercial feel than a regular National Park. With visits to these two well-known Memorials in our rear view mirror, we turned toward Custer State Park (link HERE). Alan and I had not visited this Park on our honeymoon, but my research for the current trip made me realize that this was a stop not to be missed. The scenery within the Park is spectacular and, on a return trip to this area, I’d book campground reservations here if at all possible. 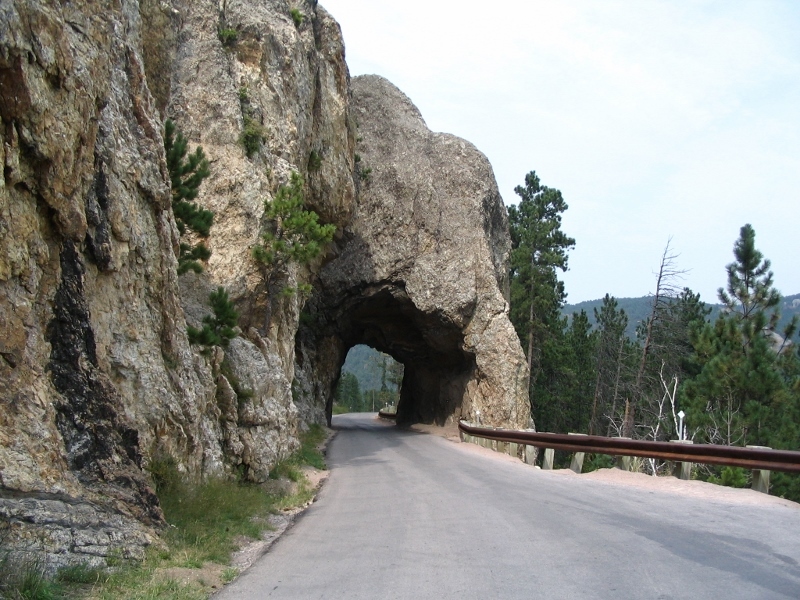 The Needles Highway and Iron Mountain Road involve scenic drives that rival any of our National Parks. Looks a little tight . 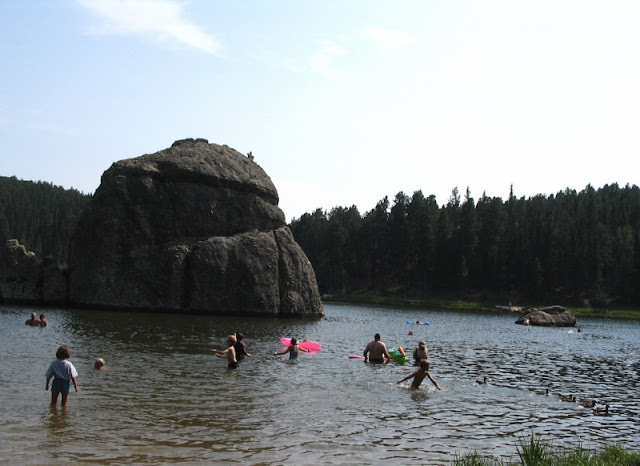 . .
Sylvan Lake is a beautiful little gem and the Wildlife Loop Road in Custer State Park provides an attraction all its own as park inhabitants include bison, elk and prairie dogs plus wild burros that enjoy stopping traffic to beg for food. In fact, we saw more bison here than in Yellowstone! 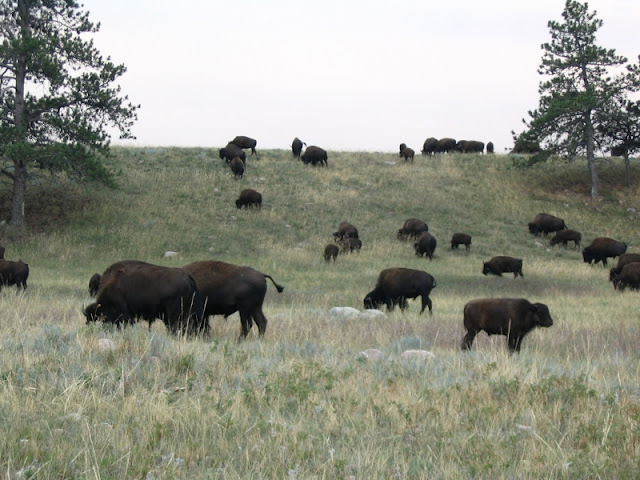 We all enjoyed our time at Custer State Park and we’d return in a heartbeat. 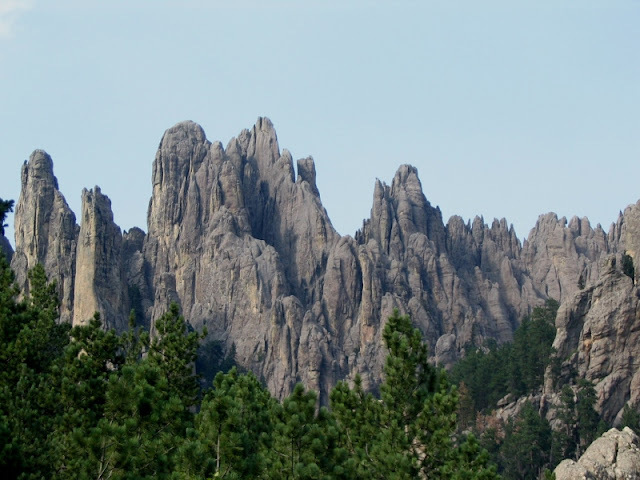 If you plan to visit the Black Hills of South Dakota, do consider adding this Park to your itinerary. I truly believe it’s a stop you won’t regret. 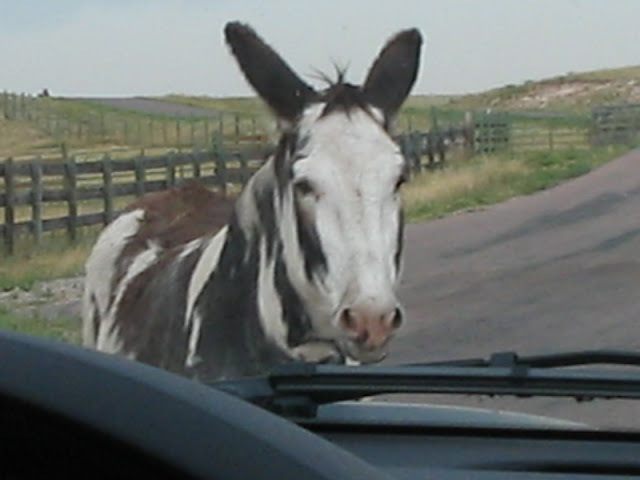 And remember to bring apples for the wild burros! Did you remember the apples? Thank you for visiting! I hope you’re enjoying the tales from the first of our family’s three cross country National Parks camping trips. Every day was an experience all its own and I hope you’ll come back to enjoy future adventures with us! Please feel free to share your own experience at Mount Rushmore, the Crazy Horse Memorial or Custer State Park in the Comments section below! Love Custer State Park. My daughter and I stayed there as our base camp when we visited that area. So much to see. The needles were a scary drive. I learned that I’m quite the wimp on mountain roads. Love you trip story. Well, you might be a "mountain road wimp," but you're not the only one. There is a hairpin turn near Glacier Point in Yosemite that nearly did me in. Thank you for your kind words ~ happy travels! brought back memories of our stay at Custer State Park back in the mid 1960's. Me thinks its time for a return trip. I feel the same! Documenting that trip for this blog is bringing back so many delightful memories - I can still remember being surrounded by that herd of bison as they crossed the Park road. Custer is definitely a jewel in the South Dakota State Park system! Just rediscovering your blog and found this entry and the one before about the parks in South Dakota. We are traveling (not camping though) on a long weekend in June! Thanks for the insight. Hope to hit a few more parks on future trips. Glacier and Yellowstone are next on our list. Have you ever travelled across the border to Canada? We love visiting Banff and Lake Louise! Hi, Gina! The fact that you and Jim love Banff and Lake Louise has actually come up in conversation when Alan and I have been talking about the Parks. We've not made any official plans to visit, but several of the Parks in Canada, including your favorites, remain in the back of our mind. Alan's sister and brother-in-law visited a number of them via an organized tour this past summer and loved them. Safe and fun-filled travels to the Dalys in 2019!